The picture was taken behind Harvey Dale on Dale Road. For any budding David Baileys if coming into Matlock from Derby just before the bridge over the Derwent take the left turn to Snitterton.You need to abandon your car somewhere near here by the way because just after the French Wine premises you then turn left up to Bridge Farm and into the fields beyond, take the left fork,where the sign has fallen down and follow the path through the stile and across the field through the wide opening in the hedge. About ten yards into that field you will find some sticks about ten foot to your left ,an X marks the spot .If you do not think it is exactly from there you could try your luck a bit further down but make sure you have a big plank because you will be standing in mid air over the Quarry! Which is the most likely spot from where it was taken before more of the cliff face was destroyed. There was once a footpath along here but has been closed for some time, it is now closed of with barbed wire, more than one person dying from a fall from the Quarry top.The house in the front left is currently still standing on Dale Road, an accountants premises. The chimneys and roofs before it belong to houses on Holt Lane. The river, now in flood, looks like it does in the picture, but the sandy point on the right bank now extends into the middle of the river for most of the year. The river at this point is about to go under the Matlock to Derby railway bridge. The white track extreme left is a Cycling track and beyond that, three tennis courts. On the 1880 OS this was once a rifle range with the target on the other side of the river! The Tennis courts were provided for his friends by Charles EVANS jeweller along with a "secret garden", the courts were operative until the second world war, there was also a bowls green which lasted into the 1980s. The path on the right is Lovers Walk. The white rock just after the bend in Lovers Walk is Pic Tor called Pig Tor on the 1898 OS, there were no paths along there in 1898, well I wouldn't fancy being shot at either. One of the many rubbish dumps can be found near Pic Tor, now fenced off. The church is St Giles parish church of Matlock. 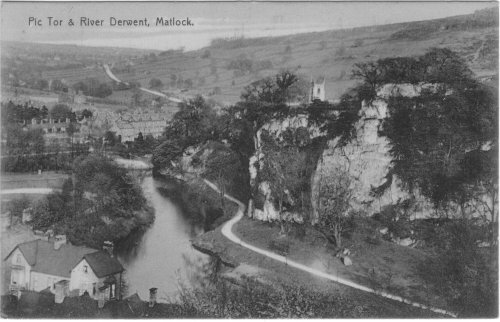 The tall buildings in the middle are houses on Knowleston Place, named after the KNOWLES family, one of the oldest houses in Matlock is on the end of that row, but now not lived in. Immediately behind Knowleston Place is the famous Mullet Hill. To the left of Knowleston place are a group of chimneys belonging to the Almshouses. Going back to the river, where it ends on the photo is a bend going to the left.This is a very deep and dangerous spot. A local policeman, (local in the sense that he had only been in the area a matter of weeks, having been transferred from Buxton), in around 1912 era drowned here trying to save a young woman he was escorting to the Police Station who had beeen accused of stealing. She ran and jumped into the river and he drowned in the failed rescue attempt. A memorial on or near the spot erected to honour him is believed to be the first memorial to any Policeman in the world. Behind the Almshouses, a large building stands out, this I thought may have been Baileys Mill, but on reflection and looking at the view from above Matlock it seems to be the large house that stood for many years on its own on Mornington Rise or a large house on Lime Tree road, maybe even an Independent Chapel. There was a Matlock Green Congregational chapel on Lime Tree Road.The Tithe of 1847 shows an Independent chapel but with other buildings close by, that is what leads me to think it is Mornington Rise. The road shown leading onto the horizon is of course the way to Alfreton and Nottingham. Houses either side were occupied in 1847 by Peter KNOWLES, Joseph BLACKWELL ,Joseph BELL and George BRELSFORD. The clump of trees on the top hides Hill Top farm, farm of Timothy TAYLOR in 1847 and his Fantom Hagg fields. On the left in the distance is Tansley. When we got home we had a two hour power cut! From a "Real Photo" postcard, posted 1907. Because its "RP" there is a great deal of detail to be seen. One day I will try to get a modern photo from the same place.